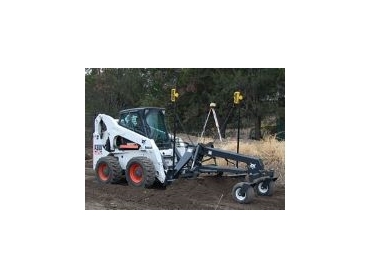 The New Bobcat Grader attachment is designed for use by landscaping, asphalt, curb/gutter, concrete and general contractors. The new Bobcat Grader Features a 2100 mm, six-way hydraulically controlled moldboard, operated with switches mounted on the loader's steering levers for precise fingertip control. The Bobcat grader attachment features a heavy-duty modular design and an improved optional laser control system. Introduces wider wheels, for better flotation and a higher load rating. The moldboard offsets to the left or right in 150 mm increments, for a total of 300 mm to the left or right. Colour coded weather pack connectors plug directly into the grader valve system, eliminating hard wiring on the loader and making installation of the grader's laser system easier. Laser mounts are integrated right into the moldboard, for quick and easy mounting of the receiver poles. The laser receiver can be placed anywhere within a 50 m radius, to set the depth of the blade. The laser system automatically moves the blade up or down to keep the base material exactly in line. Significantly reducing time and labour, for flat work preparation. Simple to use and produces perfect results.